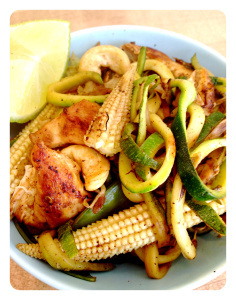 Chili & Lime Noodle and Chicken Stir fry - Underground Fitness Dun Laoghaire | Bray | Dublin & Wicklow - Personal Training, Group Training and Bootcamps. This recipe is Gluten Free, Dairy Free & Paleo (skip the corn!). It’s still really light and low in carbs and full of protein. You can add in whatever vegetables you like and play around with the seasonings depending on your tastes! Cut the chicken into little pieces and sprinkle with chilli powder and a squeeze of lime. Heat some sesame oil in a large pan and then add the chicken and veg to the pan. Cook until the chicken is nice and brown, adding a little more chilli and lime half way through. Spriralize the courgettes while it’s cooking. When everything is cooked add in the courgettes and cashews and cook for about another 2 minutes, stirring and tossing everything regularly. Take off the heat and squeeze a little more lime on and serve.